Dreambox Triple Hybrid Multistream Tuner - Buy at dreamportugal.pt! 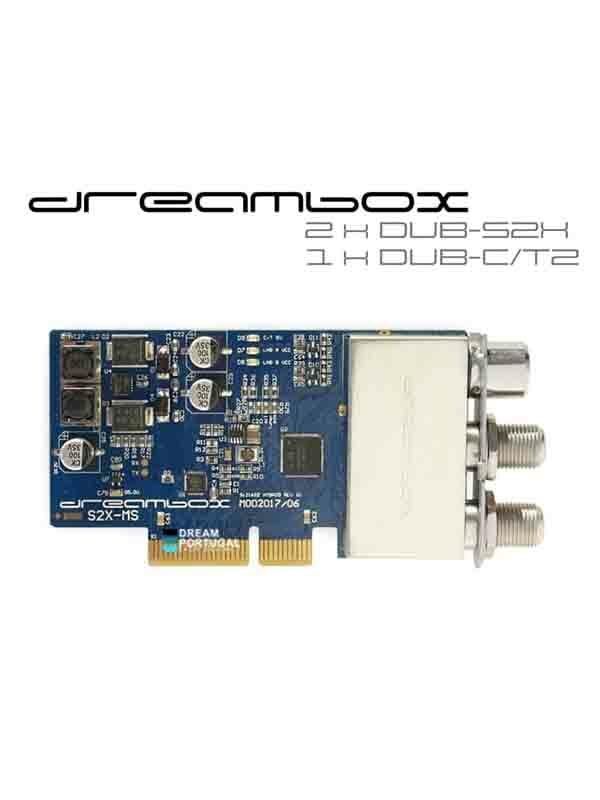 The new Dreambox Triple Multistream Hybrid Tuner (2x DVB-S2X Multistream /C/T/T2) for Dreambox receivers with DreamOS. Compact design size, low heat generation and low energy consumption. Equipped with state-of-the-art technology from the semiconductor expert Silicon Lab, the triple multistream hybrid tuner extends the reception possibilities of your Dreambox. The Triple Hybrid Silicon Tuner (2xS2X Multistream / 1xC / T2) is compatible with the Dreamboxes DM820 HD, DM7080 HD, DM900 UHD and DM920 UHD 4K. Turning the Dreambox into a powerful twin-satellite receiver with additional DVB-T/T2 or DVB-C tuner. The DM7080HD with the new Silicon Tuner increases its potential of to up to five inputs. The plug and play tuner has two DVB-S/S2X Multistream inputs and a DVB-C/T/T2 hybrid input and is easily inserted into the intended slot. On the next boot, the Dreambox automatically detects and configures the new tuner. Further settings can then be made in the Dreambox menu. The new Triple Tuner design from Silicon Labs enables not only a blind scan with the Dreambox, but also channel feeds at unprecedented speed. Even if the tuner is only supplied with TV and radio signals via a cable, programs can be recorded by one transponder and at the same time viewed by others.